Please be aware; this is purely a listing service. None of the child carers or their qualifications have been checked out or verified by Ryedale Mumbler. Ryedale Mumbler does not endorse or recommend any of these child carers and parents are required to make their own enquiries and check references. Please see our full terms and conditions. Contact us here if you are a nursery, preschool, childminder, nanny or babysitter and would like to be included in this listing. Pre-Schools usually offer sessional care for children from the age of 2 to 5. They often work only in term-time, and in most cases offer funded provision for 3 and 4 year olds. They will be OFSTED registered and you can usual pay for top up sessions if you need more than the funded sessions. These are often but not always attached to a primary although attendance does not guarantee a place at the primary school. 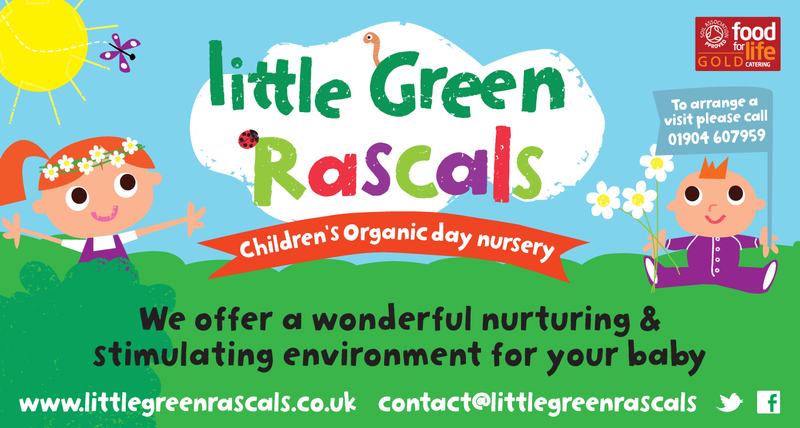 The first organic nursery in the North, Little Green Rascals features four beautiful settings; in Flaxton including before and after school club as well as Elvington on the site of the York Maze, Tadcaster Road opposite the racecourse and Bishopthorpe. Vegetable gardens, chickens and guinea pigs galore! For more information, please visit www.littlegreenrascals.co.uk. Provide care for babies through to children of school age. Day Nursery from 0 – 5 years. Open from 7.30am – 6.00pm Monday to Friday all year, except for a week over Christmas, and bank holidays. Full day and half day sessions. We aim to provide a warm, safe and caring environment to help each child develop to their full potential. All our staff are fully qualified with a wealth of experience. We have been awarded ‘Outstanding’ in all Ofsted inspections. We cater for babies and children aged 0-5 years.